Самолет HE 3 с 75-сильным (56 кВт) мотором Siemens-Halske в 1923 году выиграл в Готенбурге гонки гидросамолетов в классе спортивных и туристских машин. В передней кабине размещались бок о бок два человека, еще один человек находился в задней кабине. Самолет HE 18 являлся двухместным серийным вариантом HE 3 с каркасом фюзеляжа из стальных труб (вместо деревянного) и с полотняной обшивкой. IN view of the recent production in this country of a two-seater machine fitted with an engine of 60-70 h.p., and intended for school and sporting flying, i.e. the De Havilland "Moth" with "Cirrus" engine, described and illustrated in FLIGHT of March 5, it is of interest to know what other nations are doing in the matter of machines of approximately this power, and we are, therefore, pleased to be able to place before our readers this week details and illustrations of the new German machine which forms the subject of the following article. Owing to the limitations placed upon the size and power of German aircraft by the Versailles treaty, German designers have for the last few years been turning their attention to machines of a power permitted by the Allies, and have in consequence obtained considerable experience with machines of relatively low power. But for the absence of suitable German small engines it seems likely that more would have been accomplished with really low-power machines, of the type known in this country as light 'planes. As it is, most of the German light 'planes have been fitted with British motor-cycle engines. In the low-power or "not-quite-so-light" 'plane class, however, the Germans designers have had available for several years engines of suitable type, and most of the German machines are, therefore, fitted with German engines, among which the two types of Siemens radial engines appear to have become most popular. 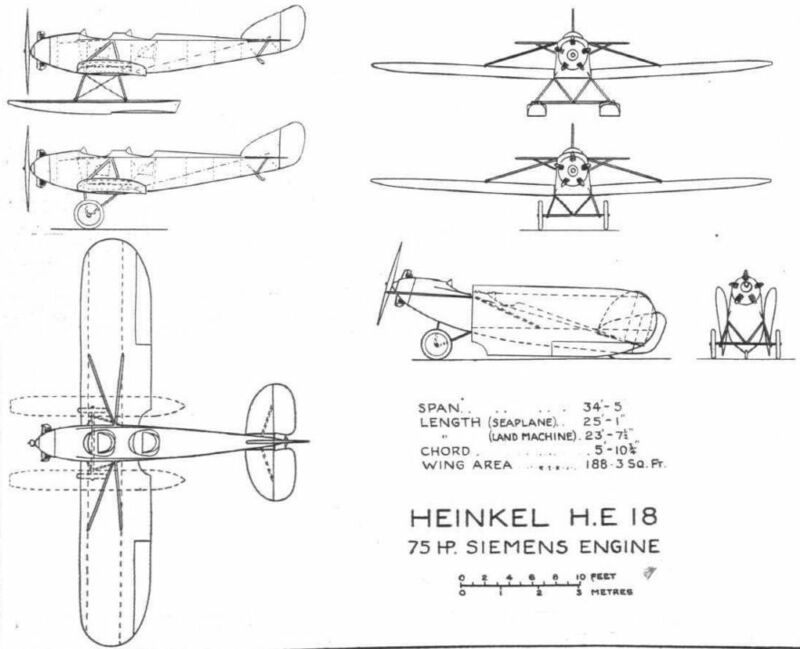 The Heinkel H.E.18 shown in the accompanying illustrations was designed by Herr Ernst Heinkel, at one time chief designer to the Caspar works, but now established with his own firm, and constructed by that firm, the Heinkel Flugzeugwerke at Warnemunde. The machine is the outcome of the Heinkel HE.3 of 1923, which did so well at Gothenburg, and is very similar to its prototype except in certain minor alterations, made in order to cheapen the machine in quantity production. Fundamentally the Heinkel H.E.18 is a low-wing monoplane with vee bracing struts as on the De Havilland D.H.53. One objection that has been raised against this type, and the only really serious one we have ever heard put forward, is the possible danger to the crew in case of the machine turning over on the ground. In the Heinkel two-seater provision is made against this by fitting a detachable steel tube guard running from the engine plate to the rear of the aft cockpit. In the photographs this guard is not shown in place, but it is stated that it can be fitted very quickly. The fuselage is made in two distinct types, according to the requirements of the customer. The standard type, which is the one shown in the photographs, is of steel tube construction and covered with fabric. If, however, the machine is to be used under conditions or in localities where repairs to a steel tubular structure cannot easily be effected, an all-wood fuselage, with ply-wood covering, can be supplied instead. This question of steel tube construction is one that might, we think, with advantage be taken up again now in this country in connection with low-power aeroplanes. The Fokker form of welded steel tube construction of fuselages is probably the cheapest ever devised, and one very great advantage of it is its adaptability. The change from one shape or size of fuselage to another can be very easily and simply made, and thus the risk of premature standardization does not arise. Theoretically, it is true, the welded form of construction is open to criticism, but practical experience with the Fokker machines seems to show that the fears of the theorists are not well founded. We do not suggest a slavish copying of Fokker's methods, and would avoid the use of welded joints in tension, but much of the method does appear to be very useful, and it would be interesting to have a ruling from the Air Ministry as regards the application to light 'planes. However, to return to the "H.E.18," the two cockpits are arranged in the usual way, the pilot or instructor, as the case may be, occupying the rear cockpit and the passenger or pupil the forward one. Dual controls of the usual "stick" type are provided, but that of the pupil can be removed, without the use of tools, in a few moments. The engine, which is, in the type illustrated, a 7-cylinder radial air-cooled Siemens rated at 70-80 h.p., but which may be a Siemens 5-cylinder radial of 50 h.p., or any other type desired, is mounted on a swivelling engine plate, which allows of inspecting the back of the engine, with carburettor, magneto, etc., without disconnecting any leads. Aft of the engine is a fireproof bulkhead, and the petrol tank is mounted in the deck fairing aft of this bulkhead, where sufficient head is provided to give direct gravity feed. The monoplane wings are of normal construction, with spruce spars and ribs, and are chiefly remarkable for the arrangement made for folding. The ailerons run the whole length of the wings, and are stated to give very effective lateral control. By means of a special arrangement the ailerons are also used as variable camber flaps for slow landing, the camber variation being effected by means of a lever in the pilot's cockpit, and the aileron action being retained. Reference has been made to the wing folding arrangement, which is designed to enable the owner-pilot himself to fold the wings without assistance. The operation consists in folding the two halves of the monoplane wing against the sides of the fuselage, the space in the folded position being further reduced by folding the tail plane against the fin and rudder. The wing-bracing struts are not detached from the fuselage, and in fact the rear strut is not disturbed at all. The front strut is cast off at the front spar attachment and swung forward against the side of the fuselage, where it is held in position by a clip. The quick-release attachment of the front spar to the fuselage is next released, the wing is swung into a vertical position, leading edge uppermost, and folded along the sides. Doing one side at a time, the pilot can easily fold the wings himself without outside assistance, and the machine can then be stowed in a very small space, or trailed after a motor-car or motor-bicycle. The undercarriage shown in our photographs is of the simple V-type, but in the general arrangement drawings a different form is illustrated, probably with a view to indicate the easy transformation of the machine into a seaplane of the twin-float type. The photograph showing the "H.E.18" as a seaplane indicates a balanced elevator, so that apparently slightly larger tail surfaces are fitted when the machine is used as a seaplane. 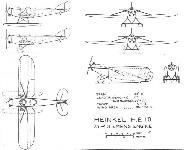 The main dimensions of the Heinkel "H.E.18" are: Length, o.a., 7-20 m. (23 ft. 7 ins. ); span, 11.10 m. (36 ft. 5 ins.) total wing area, including ailerons, 188 sq. ft. Weight of machine empty 380 kgs. (836 lb. ); useful load, 220 kgs. (484 lbs. ); total loaded weight, 600 kgs. (1,320 lbs.) Maximum speed, 150 km./h. (93-7 m.p.h. ); cruising speed, 140 km./h. (87 m.p.h.). Climb to 1,000 m. in 6 minutes. No figures are available relating to the landing speed, but in view of the relatively high wing loading this is probably fairly high. The Ernst Heinkel Flugzeugwerke of Warnemunde will be represented by no less than four different types of Heinkel machines, some entered by the Heinkel firm and some by other firms or by private individuals. One of the Heinkel types has already been described in FLIGHT, i.e., the H.E.18 low-wing monoplane, an illustrated description of which appeared in our issue of March 26, 1925. For the convenience of our readers, we are reproducing a three-quarter rear view of this machine herewith, but for a detailed description we must refer readers to the issue mentioned above. It may be mentioned that the H.E.18 is produced, both as an aeroplane and as a seaplane. The length of the H.E. 18 is 7-2 m. (23 ft. 7 ins.) and the span, 11-1 m. (36 ft. 5 ins. ); total wing area, 180 sq. ft.; weight of machine, empty, 380 kg. (836 lb. ); useful load, 220 kg. (484 lb. ); total loaded weight, 600 kg. (1,320 lb. ); top speed, 150 km./h. (93-7 m.p.h. ); cruising speed, 140 km./h. (87 m.p.h. ); climb to 1,000 m. in 6 mins. The Heinkel H.E.3 fitted with wheel undercarriage for land work. The Heinkel H.E.3 cantilever monoplane (80-110 h.p. Siemens-Sternmotor), with floats. THE HEINKEL H.E.18: Three-quarter rear view from above. This photograph gives an excellent idea of the lines of the machine. The engine is a Siemens. THE HEINKEL H.E.18: Three-quarter front view. The engine is a 75 h.p. Siemens radial. THE H.E.18 AS A SEAPLANE: The long floats do away with the necessity for a tail float.